Occasionally I visit Antique Fairs, mostly as an accompaniment to my Wife who’s into Art Deco, so I take the opportunity to seek out any Watch sellers that happen to be there. Today we did just that and I sort of went my way and she hers – but anyway the upshot is that in amongst the rubbishy “house clearance” stuff and quite a few watches that obviously lived their lives in boxes full of old nails (mostly rubbish!) I did come across a guy who actually had some decent stuff. And his prices were the sort of prices I understand – he’s a watch guy – say no more! and we got on. Quite a few decent models there from Jaeger LeCoultre to Omega to Rolex and so on, but the one that caught my eye was this lovely super condition Eterna-Matic 2002 from 1973. It simply stood out as the great model it is and as good today as when it was produced. 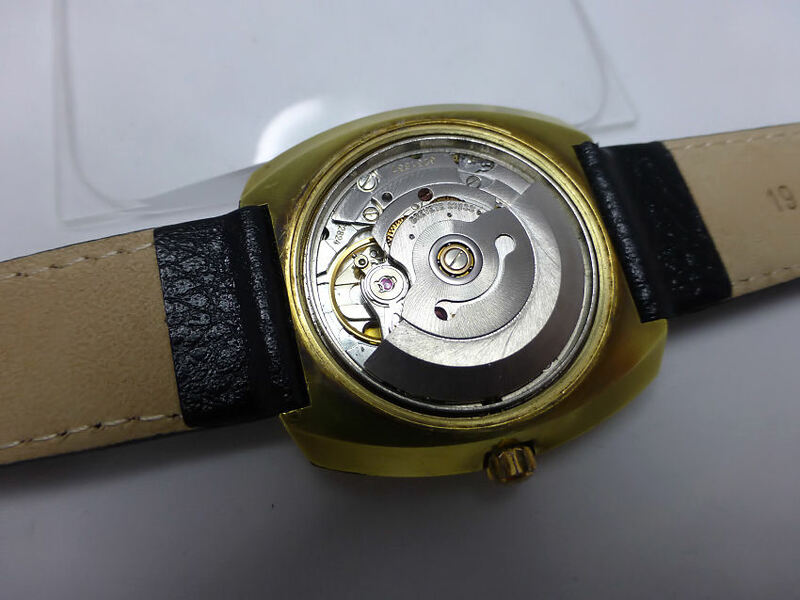 The case is that lovely almost cushion but moreTonneau ’70s style and is in really good condition with no corrosion or plating loss. The excellent mechanical movement is the Calibre 12824 or ETA 2824 automatic date, which beats along at a very smooth 28,800 a/h frequency. The movement number scribed on the movement as was the Eterna-Matic name, Brevet Swiss (Swiss patented) and the screw back in Stainless Steel 459T grade (don’t think it’s around these days). The movement condition is about as good as it gets, the rotor sweet and smooth and the watch dial is something to be very pleased about. The watch back is a screwed stainless steel with a perfect condition rubber gasket seal with case number engraved. 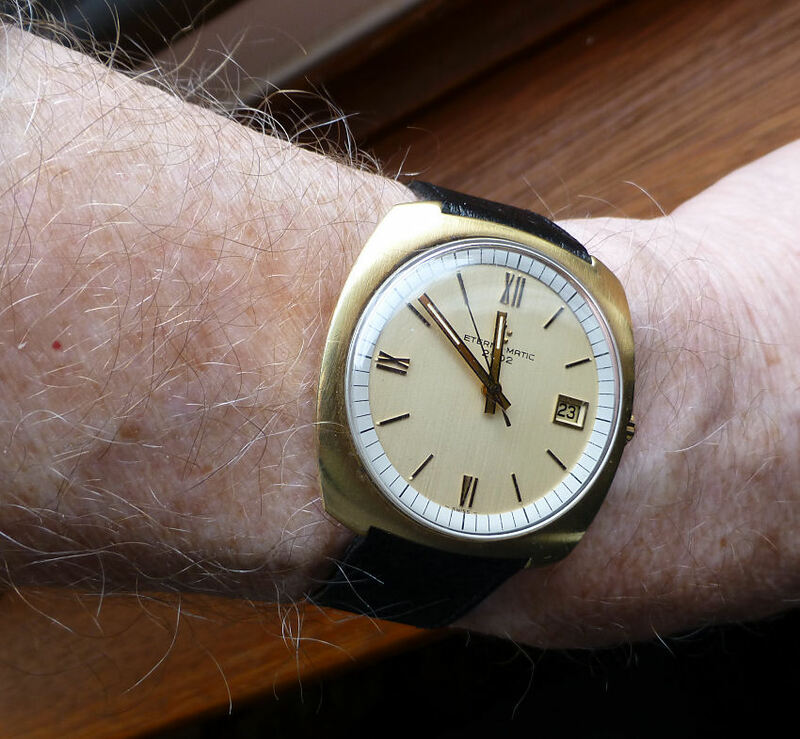 Perfect original dial – not bad after 43 years! No corrosion evident – the gold hands and baton markers crisp and clear, the dial’s vertical brushed Gold texture background and wonderfully light contrasting outer index a total delight and all original. Including (and I don’t see this very often, if ever) a fully marked with 5 protruding balls logo Crown which looks really neat and matches the dial logo. The strap is a 19 mm wide non-original Condor in Buffalo Calf which matches up very nicely. The other point about this watch are the dimensions – it is perfect for me or indeed anybody today despite the penchant for large watches, this just fits perfectly. Approximately 38 mm wide (39 mm including the semi-recessed Crown) by 37 mm lug to lug and the wrist shot is self evident – pretty much perfect. As good as it gets on the wrist! Makes some modern watches look bland! The watch functions smoothly, the date change crisp and the date wheel is in perfect condition and it is one very accurate movement, as was intended. 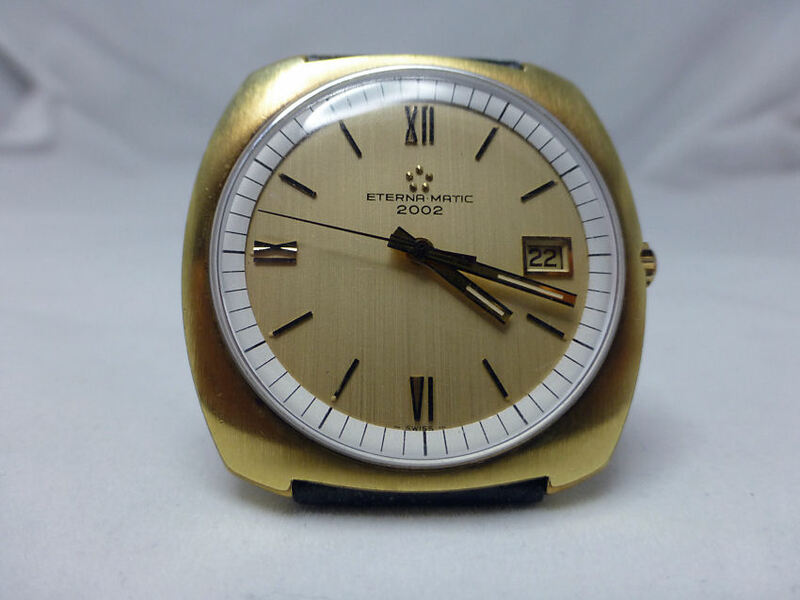 Interesting model this as it started off life in 1972 (Eterna have been around sine 1856) and it was with this Eterna-Matic named model that the Company sort of re-introduced itself to the world. It was a bit of a revelation in the Watch Industry as it was the first watch to wind itself automatically by means of ball bearings – self polishing too which reduced friction losses considerably and as a result produced a remarkably accurate automatic movement. They even offered a Ladies model with the same set up – and that was something really new. And so here it is today after 43 years and looking great! – now that has to be quality. And as to value? Well let’s just say that I was VERY pleased . . . . 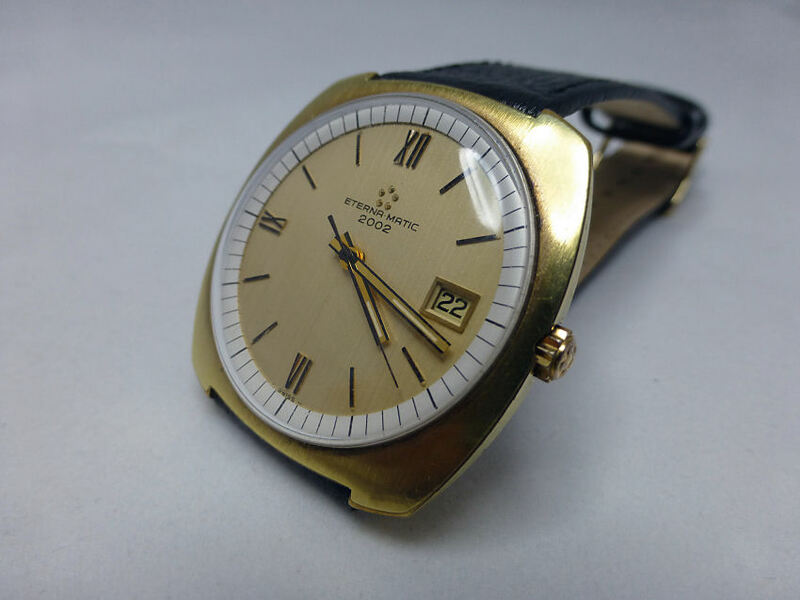 Note – Eterna today is often forgotten about by the mainstream, which is an oversight in my opinion as their range of models are both technically interesting and varied. Models such as the Adventic which features the Eterna in-house Calibre 3843 with their Eterna Spherodrive mechanism (ball bearing mounted barrel) or the hand wound Madison big date (one of my favorites), which features an 8 day Calibre 3510 with a serially coupled pair of spring barrels working in tandem to deliver 192 hours of power thanks to the Spherodrive system. This is a hand wound model that only requires to be wound 3 times a month! So plenty of innovation from Eterna and certainly should be looked at more closely if looking for a more individual watch today. I hope to run a Post soon on the range of models currently available – and that range can be seen HERE. Note – This post also appears in my Vintage Gents page.